I have been practicing yoga for over seven years. I hike, I do a little weight training, I run a little, and I like to stay pretty active. I consider myself to be a fairly athletic person. I have been teaching yoga for a few years and I truly love sharing it with clients. Yoga is about combining breath with movement (same as Pilates! !—I just recently learned this). In yoga, if you can control the breath and engage your core, it is easier to find balance and sustained energy during the process of getting into poses. I have discovered that having weakness in the abdominals, both in my own personal practice as well as with some of my students, limits you from achieving certain goals…..aka Crow pose!! To so many this pose seems unattainable. My favorite is when they get a taste of it…those toes lift up for a few split seconds….you can almost hear their heart shouting….YES! The secret is that the physical key to this pose is core strength. In my own personal athletic practices I am looking to increase my strength as well as endurance. I am having a little trouble with some advanced yoga poses I am working on. I happened to meet this cool chick that knows a lot about the body and she was sharing with me a little about what she teaches. 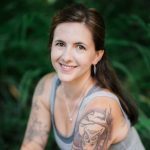 Her name is Amy Hershey and she is opening a Pilates studio in Leesburg. We met to discuss adding Yoga classes with her Pilates classes at the new studio. So, I decided to try Pilates! Yikes! I saw the intimidating equipment and also thought about how abdominal exercises make me want to throw up…..and I was not so sure what I got myself into….but I went. It was an introductory class so we got to try a little bit of everything; mat stuff and equipment exercises. I had no idea how similar Yoga and Pilates were…and boy do they complement each other!! I’m serious! The best yoga practice I have ever had was a few days after I tried Pilates. Not right away of course…because I could barely laugh due to the soreness! Pilates worked things I didn’t even know were there- wow! My breath was very strong and even which allowed me to focus on my body while allowing me to get deeper into the poses and with more confidence. In Yoga we talk about the bandhas, energy locks in the body that we engage in order to protect and strengthen during the poses. In Pilates, we do the same thing! Different terms, same idea. They complement each other and I think my Pilates instructor, Val, was pretty impressed that I knew how to breath with the belly engaged…even as a first timer! Thank you, Yoga! I always thought that people chose between the two; they were either a yoga person or a Pilates person. But what I discovered is that we should be doing BOTH! They have different avenues towards achieving the same goals. Honestly, I was surprised at how strengthening Pilates was…even just taking a beginner class! 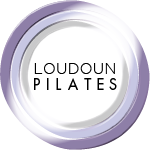 I understand now why Amy asked me to teach yoga here at Loudoun Pilates and not only do I now recommend Pilates to my loyal yogis, I am excited about incorporating it into my practice and continuing to learn more.